Reinforced Polyethylene (RPE) is one of the most affordable and effective geomembrane liner materials on the market today, with some of the best physical characteristics in the liner industry. RPE has unmatched puncture and tear resistance compared to other geomembranes available. Reinforced Polyethylene originally was used primarily for tarps & covers but was later found to be a perfect fit as pond liner material. RPE is now being used more often for secondary containment applications as well such as in the fracking industry on containment rigs due to its high chemical resistance properties. 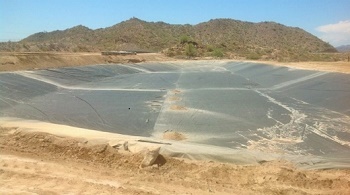 Western Environmental Liner provides the highest quality reinforced polyethylene liner material in the industry, and we are one of the leading HDPE geomembrane liner manufacturers worldwide. With over 30 years of experience with reinforced polyethylene, we have become an expert when it comes to understanding the most valuable RPE physical properties & ensuring these properties are in each reinforced polyethylene liner provided. To differentiate our product from the competitors who may use lower quality resins & raw goods as well as lower quality production machinery and facilities, we have created the Aqua Series so you know that you’re receiving only the highest quality reinforced polyethylene available on the market today. Western Environmental Liner uses only virgin resins in its reinforced polyethylene. This allows for a very consistent geomembrane liner material. High quality LLDPE coating blend allows for very long u.v. resistance and excellent welding properties, abrasion resistance, and high impermeability. A high quality, high thread count HDPE scrim is used to ensure extremely high puncture resistance & tear resistance. Western Environmental Liner is one of the largest providers - if not the largest provider - of reinforced polyethylene in the world with its parent company Western Ag Enterprises utilizing RPE for hay tarps and covers as well. Because of this we have cost efficiencies that allow us to offer excellent pricing and preformed pond liners custom made for you at the factory. These economies of scale ensures our customers are able to purchase a high density, reinforced polyethylene geomembrane liner that is both affordable and of the highest quality. The grid below shows just a few applications where our Reinforced Polyethylene (RPE) is being used. Contact Western Environmental Liner today to learn more about our Aqua line of reinforced polyethylene materials as well as other geomembrane options available. Temporary Construction pond liners, temporary pond liners and potentially long term pond liners if buried. Mid Term Pond Liners and Buried Recreational Liners such as Sports Complexes. Golf Course Pond Liners, Recreation Pond Liners, Canal Liners, nursery pond liners and any long term non-hazardous liquid containment.